Gorgeous and inspiring Cathedral, Magnificent and beautiful Basilica, Amazing church, incredible craftsmanship – a work of art and at most beauty – At some point you just realize words don’t make sense and decide to enjoy in silence, awe and wonder. 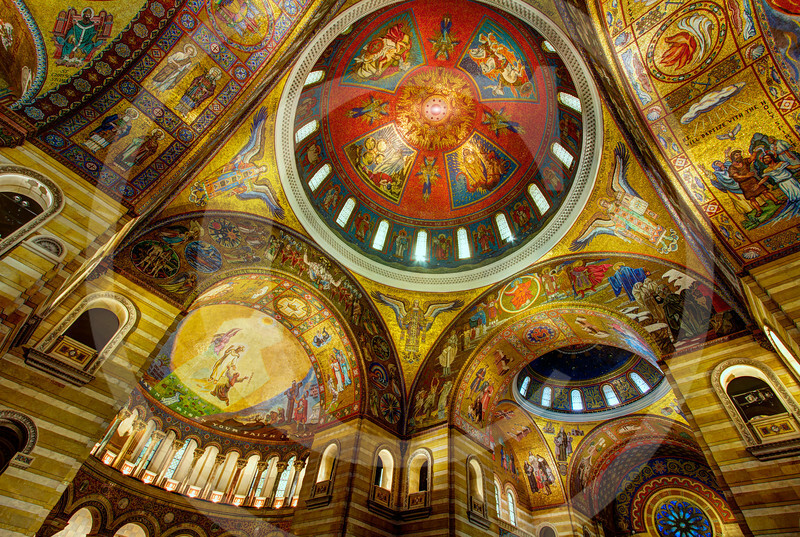 The Cathedral Basilica of St. Louis is one such place. I am so glad we visited the Cathedral as part of the Jul 4th trip. This place just transports you to Europe. (no I haven't visited Europe, but that definitely is in the bucket list :)). Cathedral Basilica of St. Louis - a great place to mediate, pray, think and wonder for hours together. I had always wanted to photograph the interior of a cathedral or church. Being a place of worship, many a times there is a restriction on the usage of tripod. From time to time I have heard from friends that it does involve sneaking in with ur tripod and asking for forgiveness later ;-) But this place was different. It was open to all, there was no restrictions on the usage of tripod or no one to bother as you take your time to enjoy each and every piece of the cathedral. The Cathedral is definitely one of the city’s most stunning building both inside and out. The detail and beauty of the mosaics are brilliant.